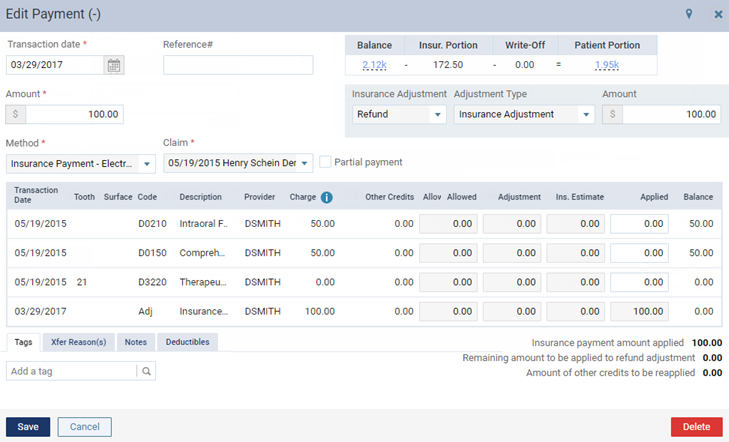 You can edit or delete a patient payment or insurance payment that has been posted to a patient's ledger. 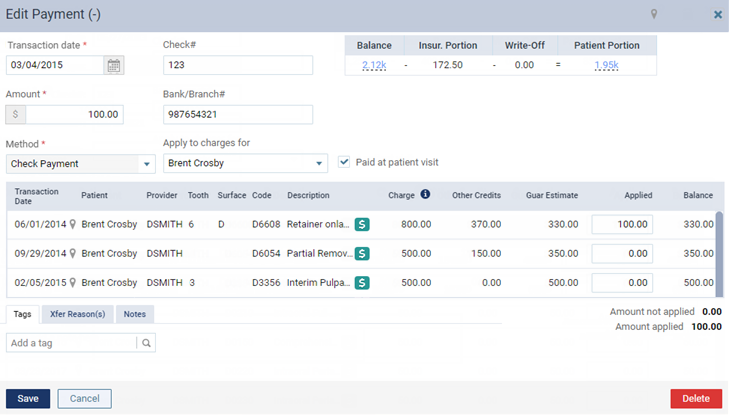 On a patient's Ledger page, select a payment. The Edit Payment dialog box appears. Change the payment details, such as the check number, amount, and applied amounts, as needed. Date - The date of the payment. To change the date, click (or tap) in the field, and select the correct date. Amount - The amount of the payment. Check # - The check number. This option is available only if the payment type is a check payment. Bank/branch # - The bank account number on the check. This option is available only if the payment type is a check payment. Reference # (Insurance payments only) - The reference number of the electronic funds transfer (EFT). This option is available only if the payment type is an electronic insurance payment. Apply to charges for (Patient payments only) - The payment goes towards charges for the current patient or another member of his or her household (including the guarantor). If you select [Guarantor], you can apply the payment to charges for any or all household members. Paid at patient visit (Patient payments only) - The payment was made at the office when services were rendered. Partial payment (Insurance payments only) - The check or electronic payment amount is less than the allowed amount or the amount billed to the insurance carrier. Applied - For each procedure or adjustment listed, the portion of the payment that is being applied to that procedure or adjustment. Notes - Any notes regarding the payment. To delete the payment, click (or tap) Delete and then OK on the confirmation message that appears. Ignore step 3. If you have made any changes, click (or tap) Save.